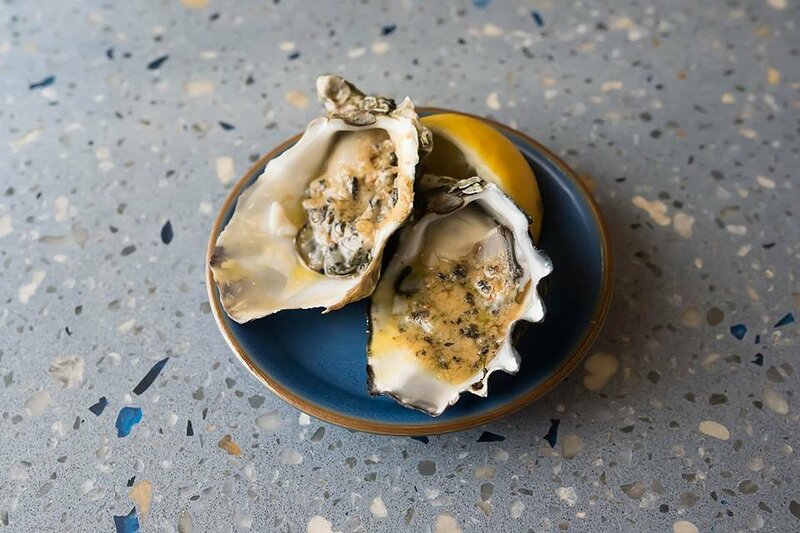 Waymouth Street’s latest addition Smallfry Seafood serves up a bevy of fresh and fried underwater delights in the name of modern fusion of East meets West. In a bright setting of timber and stone, owners Nick and Jack have introduced a new player in the game of fish and chippery, with a Japanese twist. We have been invited to try some of the items on Smallfry’s menu on their launch night and to say the least, everything was quite a catch. We start off with Baked Oysters with Miso Butter. As I slide back this pearl of the sea, the combination of the saltiness of the miso butter, and the sweetness of the plump oyster harmoniously lingers as I promptly proclaim this the definite crowd-pleaser of the menu. Do not pass on this one, it is sure to tease your taste buds for the following things to come. Still buzzing from the oceanic goodness we had just experienced, we move on to a few selections from the Shellfish section of the menu – The Tempura Prawns and the Salt & Pepper Squid. 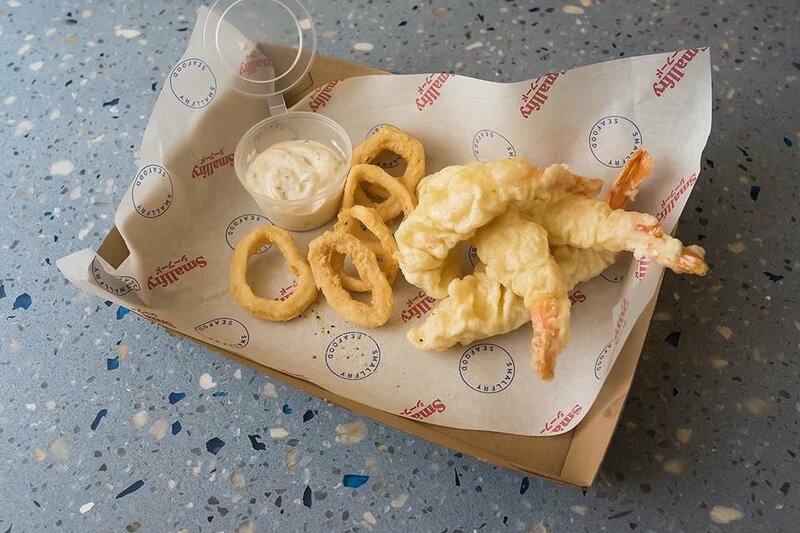 The Tempura Prawns are plump and juicy, covered in a generous coating of Tempura batter. The squid rings are crispy on the outside, and soft and tasty on the inside. 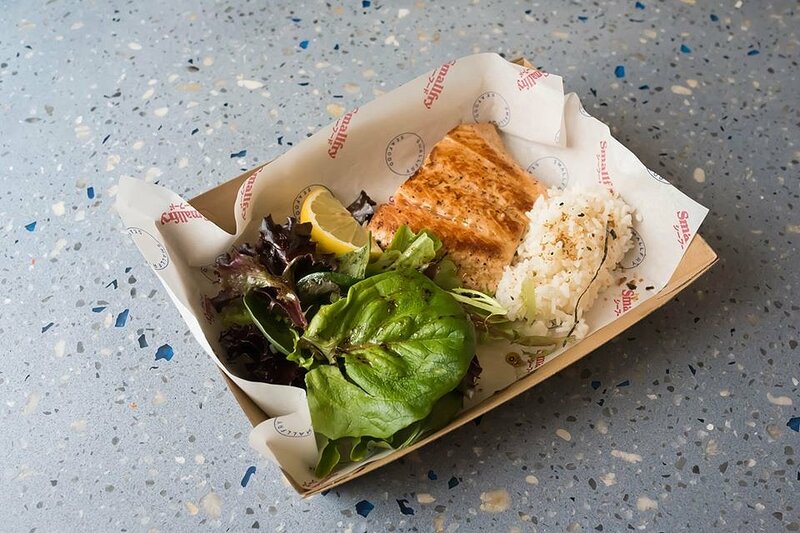 From the Fish section, we opted for the Battered Barramundi and the Grilled Salmon. 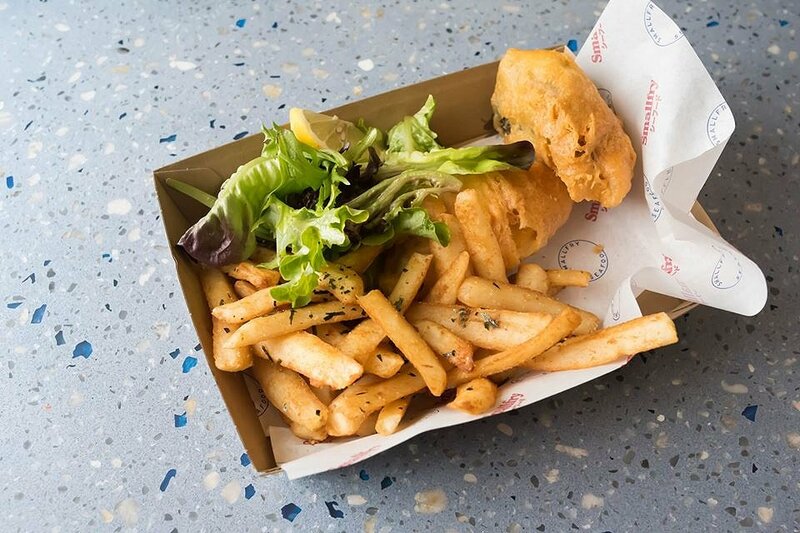 The crunchy, golden batter of the Barramundi reveals a tender and succulent piece of fish that tastes fresh and not too overpowering. We chose to have this with a side of chips which are cleverly seasoned with pieces of seaweed in line with the Japanese theme. The Grilled Salmon has a perfect crisp on its skin and a vibrant, pink center. It tastes as pleasing as it looks, flavourful and with the an ideal accompaniment of fluffy Japanese rice. 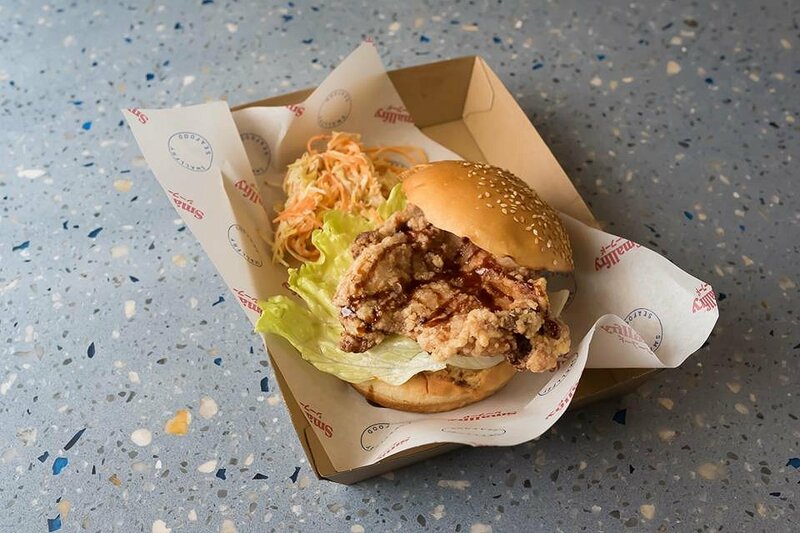 Next, we go for a different protein and try the Karage Chicken Burger – A sandwich of Sake marinated Japanese fried chicken, sticky soy, slaw and kewpie mayonnaise. The bun is soft and sweet, and compliments the crunchy and savoury chicken. The slaw on the side adds an element of texture with its crunchiness, and is tangy to balance out the creaminess of the mayonnaise in the burger. This last one features a meat that does not have any negative adjectives associated with it, apart from ‘expensive’. 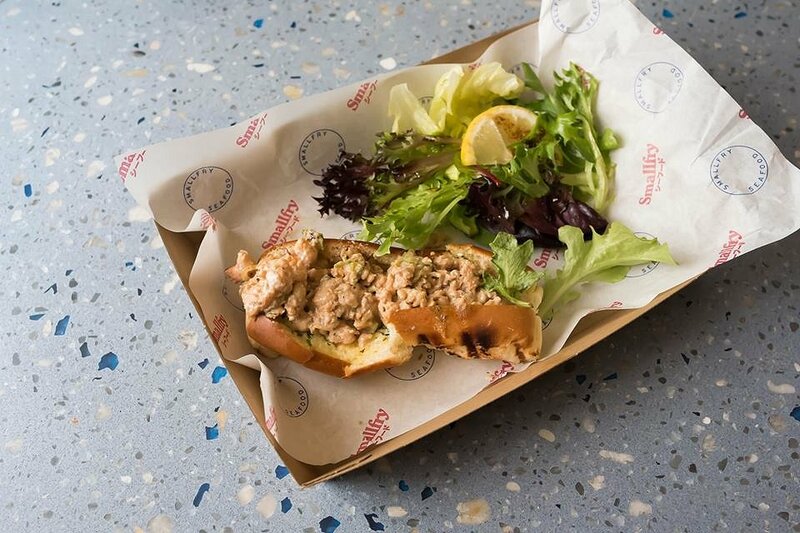 Despite that description, the Smallfry Lobster Roll – consisting of lobster, shallot, celery, smallfry secret sauce stuffed into a herb buttered bun is full of exciting flavours, and the best part is, it is at a price point that will not strain your wallet. The herb buttered bun is nicely toasted, and the lobster meat comes in good little chunks, covered bountifully with that creamy, peppery secret sauce. Oh, did we mention that they have Japanese beer on tap? We could not think of a better beverage than the light and very smooth Asahi for your fried seafood fare. We would like to thank Smallfry for the warm hospitality and delicious food. Smallfry Seafood opens this Wednesday, running from 11am to 9pm Mondays-Thursdays, and 11am till late on Fridays and Saturdays, so pop in for your seafood fix soon.